Daniel J. Murphy - dmurphy@shawmedia.com The Adams family of Huntley from left: Nick, 18, Lexi, 6, Adam (cq), and Lisa plant daylilies Saturday May 12, 2012 at the Green Trees Apartment Complex in Huntley. The McHenry County Housing Authority and Pam Fender are refurbishing the landscaping on the Complex, which houses low-income and developmentally-disabled seniors. 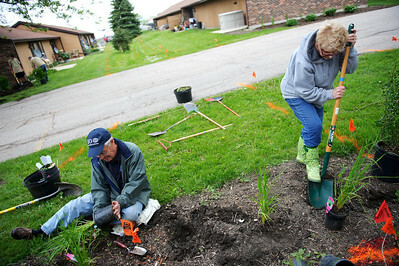 Daniel J. Murphy - dmurphy@shawmedia.com John Thunholn of and Sandy Scalise both of Huntley plant native grasses Saturday May 12, 2012 at the Green Trees Apartment Complex in Huntley. 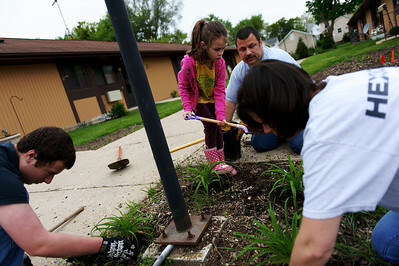 The McHenry County Housing Authority and Pam Fender are refurbishing the landscaping on the Complex, which houses low-income and developmentally-disabled seniors. Daniel J. Murphy - dmurphy@shawmedia.com Pam Fender displays the final landscape plan for Green Trees Apartment Complex in Huntley. 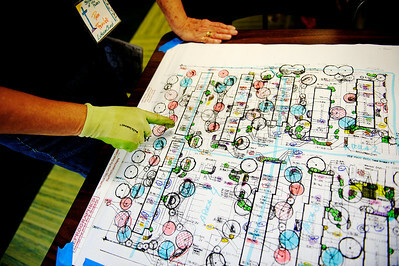 Pam Fender displays the final landscape plan for Green Trees Apartment Complex in Huntley.